‘Frugal’ is a buzzword right now. And turkey mince is one of the most frugal meat ingredients you can lay your hands on. Apart from at Christmas, the poor turkey plays second fiddle to chicken. And when it comes to mince, turkey gets forgotten in favour of beef. But if you’re concerned with cost, minced turkey pips them both at the post. I paid just £2 for 500g of turkey thigh mince from Sainsbury’s. Compare this to the average price of £3.50 for the same amount of beef. Turkey also contains 65% less fat. So it’s kinder on your wallet and your wobbly bits. 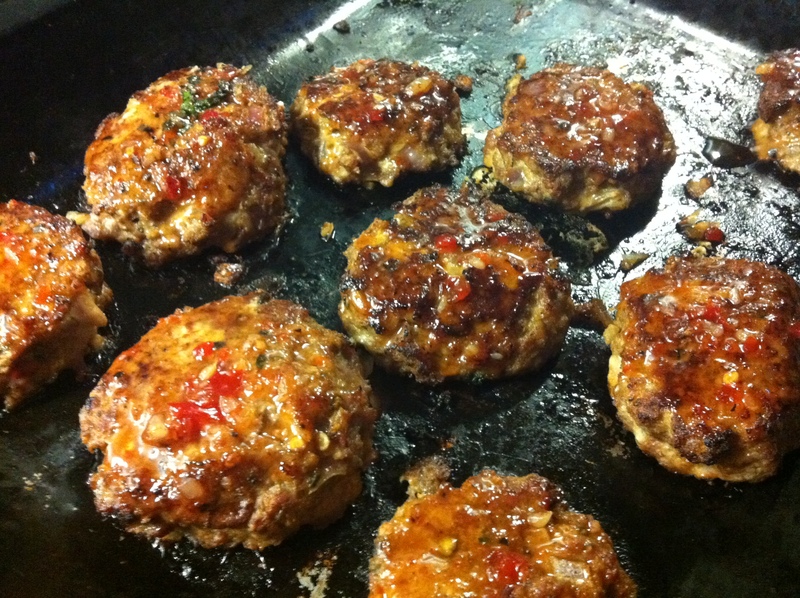 I made the mince into these burgers, quick to assemble and easy to adapt with whatever you have in the fridge. Mine are pretty frugal, but if you want something a bit fancier, try Yotam Ottolenghi’s version, which were my inspiration here. I highly recommend brushing them with the sweet chilli mixture as they come out of the oven. It sets into a beautiful glaze with a distinctive sweet and tangy taste. Preheat your oven to 170°C fan. Put the turkey mince in a large mixing bowl, season well and mix with the eggs, garlic, chopped onion, paprika, chives and breadcrumbs. Mix together and shape into 10 small, fat burger patties. Heat sunflower or vegetable oil in a large frying pan and fry the burgers for 2-3 minutes on each side, until the top and bottom are golden and sealed. The middle may still be a little pink at this stage, but don’t worry. Put onto a baking tray and finish off in the oven for 8-10 minutes. Combine the sweet chilli and rice vinegar in a small bowl, and brush the mixture over the burgers as soon as they come out of the oven. Leave for 5 minutes while the glaze sets a little and the burgers cool down enough to eat. This entry was posted in Dinners, Meat, Recipes and tagged burger, food & drink, frugal, meat, paprika, turkey by ionelou7. Bookmark the permalink.